The history of Periyar Maniammai University starts with a fame of being the first Women's Engineering College in the world. It was in the year 1988, in which the Periyar Maniammai Educational and Charitable Society in Chennai laid the foundation for the Periyar Maniammai College of Technology for Women in Thanjavur, Tamil Nadu. The idea behind the establishment of the college was to fulfil the dreams of E. V. Ramasamy, popularly known as Thanthai Periyar, and his wife Annai Maniammai who had worked for the emancipation of women. The college was started with the approval of All India Council for Technical Education, New Delhi with affiliation from Bharathidasan University. Since 2001, it is affiliated to Anna University in Chennai. "For over a period of 19 years, we were only catering to the girl's education, but due to the claims of stakeholders in the later stages, the college was conferred to be co-educational," says Dr. N. Ramachandran, Vice Chancellor, Periyar Maniammai University. In 2007, the college started functioning as a deemed university with the approval of the UGC and Ministry of Human Resources, New Delhi. Now, along with engineering and technology, PMU imparts education in the fields of architecture and planning, computing science and engineering, humanities, science and management. PMU has covered a long journey since its inception, however, they have never moved away from their lofty ideals. Today, the PMU is not just an institution providing education in different streams. Instead, it stands as an institute imparting complete education by moulding socially responsible generation. "We work with a vision to be a university of excellence in knowledge and innovation, ensuring social responsibility for creating an egalitarian society," pinpoints Dr. Ramachandran. Though, the university's ideology ages 29 years, the mentors and the teaching strategies followed by them have updated from time to time. "We have a highly experienced faculty team, which consist of the practicing professionals who abreast themselves with the latest trends," claims Dr. Ramachandran. These skilled mentors blend the curriculum in such a way that the knowledge, skill and attitude are rightly boosted among the students. The university is making efforts to create new horizons in the arena of technical education through research and novel practices. The PMU is making efforts to create new horizons in the arena of technical education through research and novel practices. Research is made a part of the academics and the focus is laid on the thinking capacity of the students. The institute does research in Basic & Applied Sciences, Mathematics, Engineering Science, Computer Science & Engineering, Information Technology, Rural Development Technology, Humanities and Management Sciences. Currently, the research is progressing in the fields of Renewable Energy, Solid Waste Management, Nanotechnology, Biotechnology, Bioinformatics, Biomedical Engineering, Wireless Technology, Networks, Optical Communication, Grid Computing, Man Machine Interface, and Social Engineering and so on with a focus is to meet the local, national and global challenges. "Everything taught at the institute is rightly followed through the extension activities and we are always into live projects wherein all the plans and projects are implemented well for the societal development. We follow lab to land practice," says Dr. Ramachandran. The Centre for students and administrative services comprising 23 clubs and 9 societies facilitate the students with personality development. While the Centre-of-Excellence for Next Generation Networks offers industry-oriented training, the Centre for Climate Change and the Centre for Rural Developments are a few of the other attractions of PMU. The University also functions with a centre named Centre for University Industry Interaction, which lays its emphasis on placements and soft skill developments for the students. Through all the means, the words Think, Innovate and Transform inscribed on the pedestal of the emblem are implemented in the curricular and extracurricular activities of the university. PMU rightly proves that education cannot be fulfilled through classroom teaching, internships and industry tie-ups. Today, the country is in need of a generation, which can work for the betterment of the society and hence, with the dissemination of 'Periyarism' to the younger generation, PMU aims at making responsible citizens. He graduated with B.E. Degree (1987) in Civil Engineering and M.E. Degree (1991) in Transportation Engineering and Management from Regional Engineering College Tiruchirrapalli, Bharathidasan University. 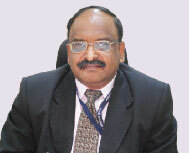 He obtained his Ph.D Degree (2002) in Architecture with high commendation from Tamil University, Thanjavur. He started his career as an instructor in a Polytechnic in 1981and raised to the present position in 2007 by a dint of industrious behaviour that he has inculcated from his predecessors.